Getting a picture of everyone involved in an Okeanos Explorer telepresence-enabled cruise is nearly impossible. More than 50 scientists and students participated in Leg 1 of the Deepwater Exploration of the Marianas expedition from around the world! Many more crew, shore-side technicians, educators, outreach specialists, and others provided critical support to enable the expedition to happen. 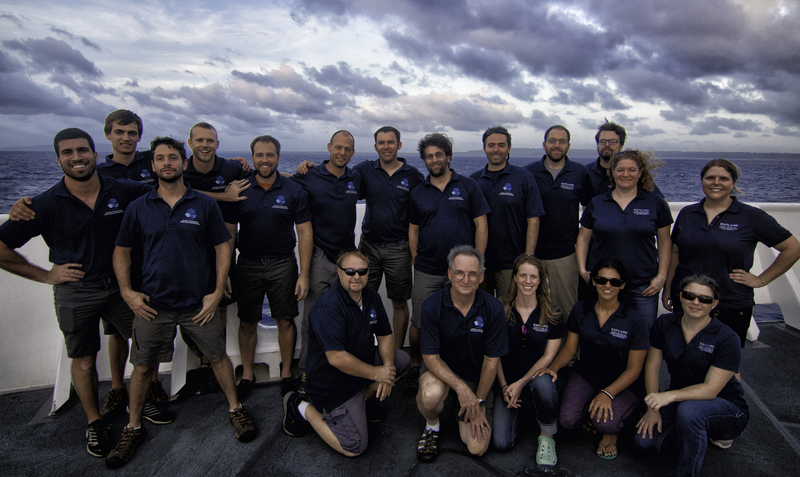 Here, the shipboard mission team poses for a picture on the bow of the ship before pulling into port in Saipan to bring Leg 1 of the expedition to a close. Image courtesy of NOAA Office of Ocean Exploration and Research, 2016 Deepwater Exploration of the Marianas. Download larger version (jpg, 2.6 MB). 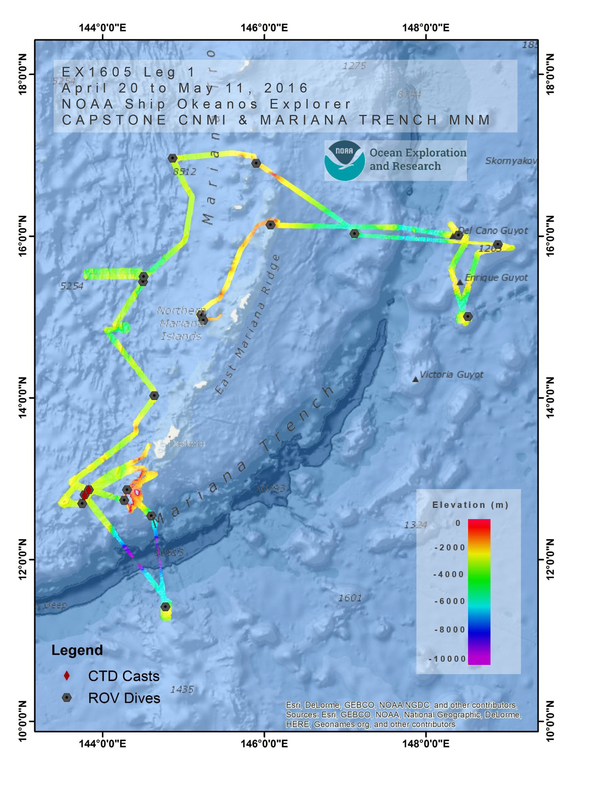 Summary map of Leg 1 of the 2016 Deepwater Exploration of the Marianas expedition showing seafloor bathymetry data that was collected and the locations of ROV dives and CTD casts conducted during the cruise. Overall, 19 ROV dives were conducted, more than 20,000 square kilometers of seafloor was mapped, and three CTD casts were carried out. Image courtesy of NOAA Office of Ocean Exploration and Research, 2016 Deepwater Exploration of the Marianas. Download larger version (jpg, 2.3 MB). We conducted 19 of 20 planned remotely operated vehicle (ROV) dives from 240 to 4,996 meters deep to survey a variety of deep-sea features, including deep-sea coral communities, high-temperature hydrothermal vents, fresh lava flows, extinct and active calderas, a mud volcano, bottomfish habitats, seamounts in the Prime Crust Zone, and the abyssal depths of the Mariana Trench. Characterization of these diverse habitats was possible thanks to the incredible participation of 52 scientists and students in the cruise, including 47 shore-based science team members who joined from 12 U.S. states, Guam, Japan, Canada, and Russia. A major highlight is that this cruise was the first effort to discover and document deep-sea coral and sponge communities in the deep waters of the Mariana Island region. Five dives were planned specifically to survey for deep-sea coral and sponge communities and six to survey for both precious coral (a subset of deep-sea corals) and bottomfish habitats. One chrysogorgiid coral we saw on Dive 18 provided a home for dozens of other animals, including benthic ctenophores, a shrimp, a squat lobster, and many zoanthids. Image courtesy of NOAA Office of Ocean Exploration and Research, 2016 Deepwater Exploration of the Marianas. Download larger version (jpg, 1.1 MB). Deep-sea coral communities are important as they can be hotspots of life with dense and diverse communities of animals relative to other areas of the seafloor. Many types of corals were documented during the cruise, including primnoids, isidids, chrysogorgiids, paragorgiids, stylasterids, desmophyllids, plexaurids, and more! The corals and sponges provide habitat and shelter for other animals. One chrysogorgid coral we saw provided a home for dozens of other animals, including over 30 ctenophores, a shrimp, a squat lobster, and 10 zoanthids. Overall, six high-density communities and two medium-density communities were documented. An unexpected discovery during one dive was the discovery of a rare high-density community of basket stars and crinoids or “sea lilies”! Six dives focused on collecting data on deepwater bottom fishery habitats of interest to commercial fishermen and fisheries managers. Several species of deepwater snapper, grouper, roughy, tuna, pomfret, and jack were documented. These dives were also designed to survey for precious corals and to investigate whether there was overlap between the ranges of the two resources. Precious corals are deepwater coral species that are valuable and harvested commercially for the jewelry industry. These corals are extremely long lived (some species have been known to live over 2,000 years) and slow growing. Although the precious-coral fishery is listed as a managed fishery in Guam and the Commonwealth of the Northern Mariana Islands, no precious coral beds had been identified prior to this cruise and only anecdotal accounts of their presence in this region of the Pacific existed. The ROV surveys conducted on this expedition confirmed the presence of precious corals – documenting pink, red, gold, and bamboo corals; however, fewer were documented than expected. We also found through our ROV observations that while there was little overlap observed between bottomfish and precious coral habitats, there was overlap between bottomfish and non-precious coral habitat. Three dives focused on looking for active hydrothermal vent sites. These sites are oases of life on the seafloor, supporting incredibly dense communities of animals – in particular chemosynthetic fauna. 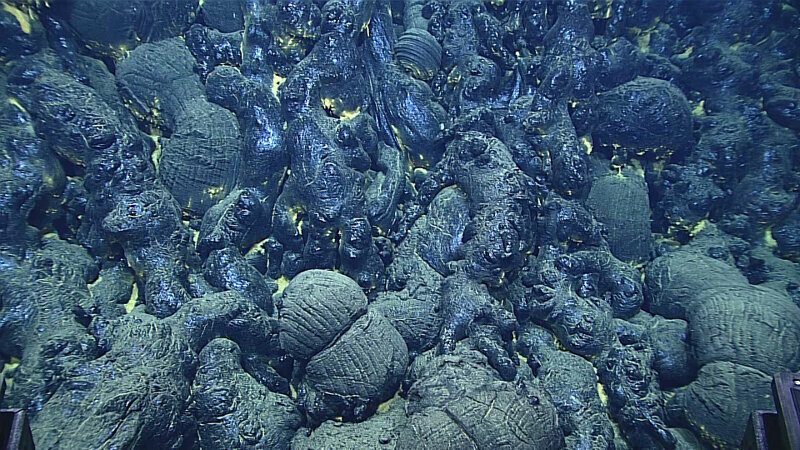 On one of these dives, we discovered a new active high-temperature “black smoker” hydrothermal vent field on the Mariana back-arc spreading center that was composed of multiple chimneys, including one that was over 30 meters tall. The field included at least two different chimney sites, plus multiple areas of diffuse flow and a circular crater feature (origin as yet undetermined) with extinct sulfides. We also saw extinct hydrothermal chimneys on another dive and extinct iron oxide chimneys in Esmeralda crater. In the deep ocean, hydrothermal vents are often oases of life, with bacteria at the vents serving as the basis of the food web in areas completely devoid of light. Video courtesy of NOAA Office of Ocean Exploration and Research, 2016 Deepwater Exploration of the Marianas. Download (mp4, 278.1 MB). One dive surveyed a new lava flow that was no more than two years old! Comparison of bathymetry collected in 2013 and 2015 indicated an eruption had occurred in the intervening years, creating new lava rock over 100 meters thick. We visited three 60-meter high pillow mounds that were composed almost entirely of glassy pillow lavas. The glass forms when molten lava erupts on the seafloor and comes in contact with very cold seawater, immediately quenching the lava, forming long tubular or round shapes, and creating glass. Samples of these glassy lavas were collected and can be analyzed to determine the original composition of the erupting lava. On Dive 9, we dove on a new pillow lava flow. Comparison of bathymetry collected in 2013 and 2015 indicated an eruption over 100 meters thick. We visited three pillow mounds that were composed almost entirely of glassy pillow lavas. Image courtesy of NOAA Office of Ocean Exploration and Research, 2016 Deepwater Exploration of the Marianas. Download larger version (jpg, 2.0 MB). Three dives surveyed Cretaceous-age guyots (flat-topped seamounts) with heavy ferromanganese crusts for initial characterization of the biological communities. These guyots are located within the Prime Crust Zone (PCZ) – the area of the Pacific with the highest concentration of commercially valuable deep-sea minerals. Knowledge of habitat structure and communities on ferromanganese-encrusted seafloor will provide valuable information to inform management decisions related to future deep-sea mining activities. It is important to characterize the biology in areas that could be of interest for deep-sea mining so that we can gauge how to manage and potentially protect these environments in the future. Video courtesy of NOAA Office of Ocean Exploration and Research, 2016 Deepwater Exploration of the Marianas. Download (mp4, 19.3 MB). Each guyot surveyed had distinct geology and species assemblages. Manganese-encrusted rocks were collected at these sites, as well as on almost every other dive during the expedition. These rock samples will be used to determine the composition and thickness of the crusts. One dive surveyed the crest of the Kunanaf Hulo’ mud volcano. 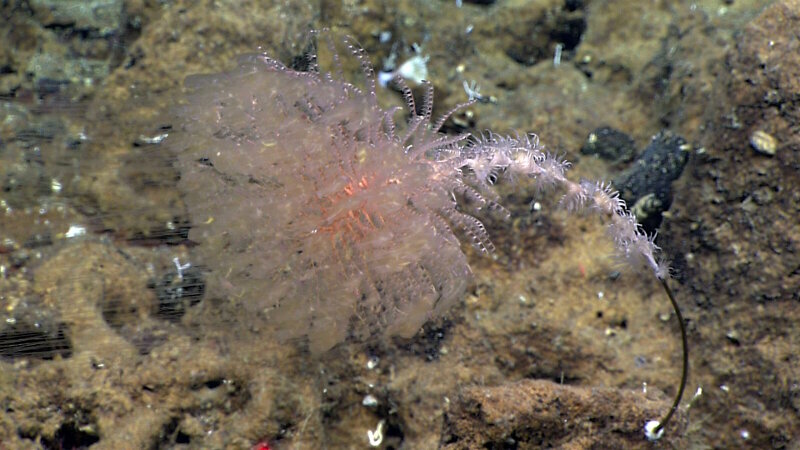 We were unable to find active seepage (typically associated with mud volcanos) and instead documented a sedimented abyssal-plain habitat that was inhabited by many deposit feeders and also suspension-feeding sponges with Relicanthus (a cnidarian similar to an anemone) living on their stalks (an association rarely seen before). Another dive collected baseline information on the faunal community in the lesser-known abyssal depths in the Marianas Trench Marine National Monument. One of the great things about exploration and working at sites that have mostly never been visited with an ROV before is that many of the fauna may be unknown, and the Mariana region has proved to be no exception. Preliminary estimates suggest that most of the 46 species collected during this leg will be new to science, although confirmation is needed by taxonomists. These include multiple corals, sponges, crustacea, and echinoderms. Additionally, there were also many animals seen during the dives that were suspected to be new species but were not collected, including a purple and yellow stalked crinoid, an orange stalked crinoid (a new genus! ), a blue tilefish, an asteroid, a beautiful jellyfish, a predatory sponge, and many more. And even if animals weren’t new to science, many had never been seen in the Mariana region previously, representing range extensions for these species. These included a slit shell snail (cf. Bayerotrochus teramachii), a jellynose eel (Guentherus kati), a gorgonocephalid basket star, several cusk eels, a large blind lobster (Acanthocaris tenuimana), and two nudibranchs, among others. Overall, more than 20,000 square kilometers of seafloor were mapped during Leg 1 – an area nearly the size of New Jersey. Overnight mapping was conducted during transits between dive sites, at planned dive sites, in targeted areas to support management interests, and to refine existing sonar coverage in the region. Targeted multibeam surveys were conducted to map and identify the 400-meter contour at Santa Rosa Bank and the north side of Farallon De Medinilla – two areas of interest to fisheries resource managers. A targeted mapping survey was also conducted offshore of Tinian to search for several lost B29 bombers from World War II – sites that are of interest to several research and management groups. The vessel’s sonar capabilities are not only used for seafloor mapping. The ship is outfitted with four single-beam EK60 fisheries sonars, each operated at a different frequency, that image and collect data about the water column directly beneath the ship. These sonars collected data overtop of areas with known or suspected hydrothermal-vent activity. Although this type of sonar is not generally used or recommended to search for hydrothermal vent activity, interesting water-column anomalies were detected over the new hydrothermal vent field site, where a black smoker was discovered at 3,400 meters during Dive 11. Anomalies were also detected in the EK60 data over Esmeralda Bank Crater – an area with known active venting. 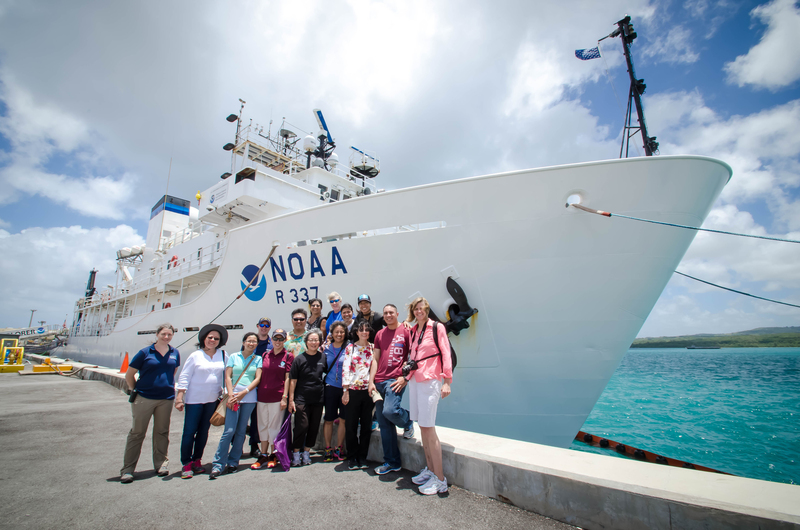 Ship tours were conducted in Guam before the start of Leg 1, and in Saipan after Leg 1 was completed, to share the expedition with educators, students, media, VIPs and the general public. Here, a group of teachers who took part in NOAA Office of Ocean Exploration and Research’s “Why Do We Explore” professional development workshop pose for a picture in front of the ship following a tour. Image courtesy of NOAA Office of Ocean Exploration and Research, 2016 Deepwater Exploration of the Marianas. Download larger version (jpg, 3.2 MB). Primary goals of NOAA's Office of Ocean Exploration and Research are to understand the ocean, share acquired knowledge with others, and to encourage the next generation of ocean explorers, scientists, and engineers. Website coverage; outreach via social media; K-12 education curricula; internships and student opportunities; and interactions with classrooms, museums, and aquariums are conducted during every Okeanos Explorer expedition. Working in partnership with NOAA Fisheries, the 2016 Deepwater Exploration of the Marianas Expedition includes a particular emphasis on engaging the local community in Guam and Saipan. We are achieving this through expedition participation, public presentations, ship tours, live interactions with aquariums and schools, and outreach by partners. Engaging the local community in Guam and Saipan started weeks before the expedition as partners spread the word at community gatherings and meetings. Before getting underway, expedition briefings were provided to the Commonwealth of the Northern Mariana Islands Senate in Saipan and at a “Science Sunday” talk hosted by the National Park Service in Guam. Ship tours were provided to educators who use Okeanos Explorer education curricula in the classroom and to the media who spread the word online, in print, and on local news stations. Partners brought a new Internet-1 based Exploration Command Center online at UnderwaterWorld Guam. The live feeds were streamed here daily and local scientists participated from here, simultaneously sharing and engaging the general public visiting the aquarium. Live interactions were also conducted between the ship and visiting student groups located at the Command Center. Image courtesy of NOAA Office of Ocean Exploration and Research, 2016 Deepwater Exploration of the Marianas. Download larger version (jpg, 4.1 MB). Partners in Guam created a new Internet-1 based Exploration Command Center at UnderwaterWorld Guam. 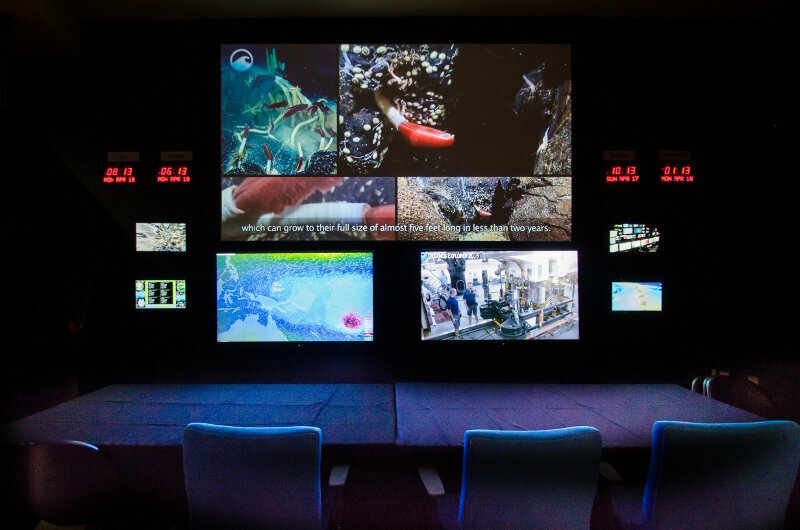 The live feeds were streamed daily and local scientists participated from here, simultaneously sharing discoveries and engaging the general public visiting the aquarium. A viewing center was also set up at the University of Guam to allow scientists to participate in the expedition and share the real-time exploration and findings with students. During the cruise, live telepresence events were conducted with UnderwaterWorld Guam and a high school in Saipan that engaged ~130 high school students. Ship tours were also hosted for nearly 250 VIPs, media, and the public after the ship pulled into port in Saipan. Last but certainly not least - we received tremendous news and media coverage by more than 70 outlets (including CNN, NPR, LA Times, Australian Broadcasting Corporation, Washington Post, Scientific American, USA Today, and the BBC). Interview requests were frequent and seven interviews were conducted during the cruise – all contributing to the live video feeds from the cruise receiving a record-breaking 2.5 million views!!! Some of these activities were conducted by the team onboard the ship, and many more were conducted by the team on shore, but all of these activities support overall NOAA and expedition objectives of better understanding the ocean, and sharing that knowledge with others. This stunningly beautiful jellyfish was seen at a depth of ~3,700 meters during Dive 4 at the informally named “Enigma Seamount.” Scientists identified this hydromedusa as belonging to the genus Crossota and have concluded that it is likely a new species. 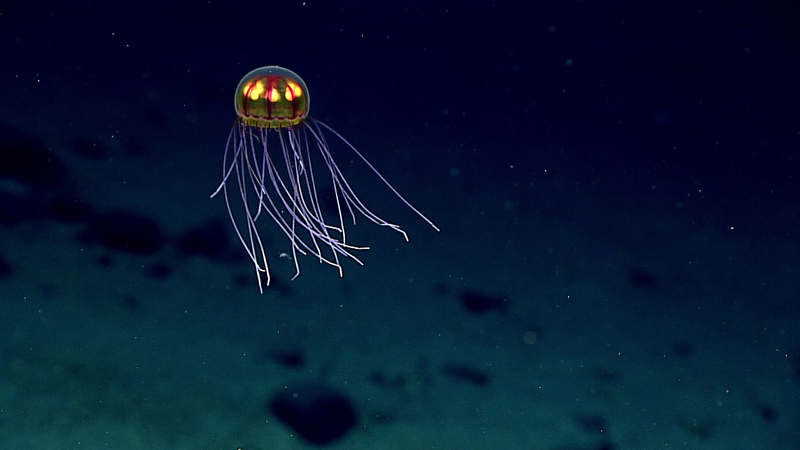 Video of this jelly went viral during the expedition, contributing to the incredibly high viewership of the live feeds! Image courtesy of NOAA Office of Ocean Exploration and Research, 2016 Deepwater Exploration of the Marianas. Download larger version (jpg, 758 KB).